At the AAASS Round Table on “Kazakh Young Cinema” (12 November 2009) Birgit Beumers raised the issue of whether we can talk about a Kazakh “new New Wave” as a movement. Indeed, how do young filmmakers fare in the highly commercialized film industry today? Certainly, Central Asian film art can only survive if young filmmakers devote themselves to cinema as art (rather than commerce) and seek private sponsors to bring it to a public that values such films, i.e. audiences of art house cinemas throughout the United States, Europe, South Korea, India, Central Asia and so forth. Film festivals are often the first intermediate step to offer recognition to the creative work of both older and younger directors of art house cinema. Clearly, if there is any future for the new group of filmmakers studying with Darezhan Omirbaev, Damir Manabai, Sabit Kalymbetov (all film instructors leading workshops at the Academy of Arts in Almaty), there must be a separate, second line of independent filmmaking beyond mainstream film. These directors must find funding by private, national and international funds, just as independent filmmakers have done for decades in the United States, existing outside mainstream cinema. Private foundations must become involved because the film industry itself is not going to support art house films, particularly those made by this younger generation. Central Asian film festivals (such as the “Shaken's Stars” film festival for debuts, or the Kyrgyz art-house festival “Kinostan”) are absolutely essential as a starting point. Here potential international producers can learn about projects by young filmmakers, who need support not just for post-production and selection for international foreign festivals, but also for the preparatory and production stages. Such workshops, forums and film festivals can provide an opportunity to view the works of a wide range of those talented younger filmmakers who will gradually replace the older generation, i.e., their mentors. What type of cinema is the younger generation of Kazakh filmmakers creating today? I attempt here to answer this question without rehearsing the topics discussed in my article on the “New ‘new wave’ Young Kazakh Cinema’ (KinoKultura 2009), but instead turning attention to several new Kazakh films, diploma works by graduates from Damir Manabai’s directors’ course at KAZNAI (Kazakh National Academy of Arts in Almaty), who continue the New Wave. Nurken Amirov and Serik Abishev are two young directors from the class graduating at KAZNAI who reject mainstream cinema with its dumbed-down artistic conventions for box office audiences. Like the Kazakh New Wave of the 1980s, they too purposely experiment with genres and techniques, rejecting some and recreating others. These filmmakers avoid a singular, unambiguous moral perspective or statement. Often quasi-documentary in style, their films represent a rebellion. They do not romanticize or poeticize today’s reality, the past, or the traditional Central Asian village in the mountains or an aul. In fact, their films may be dark, ugly, crude, or even absurd. They are not filled with a star-studded cast, but rather feature the young filmmakers and their friends, who film each other in unattractive, confining, depressing settings. Theirs is the view of distorted or disjointed “mentally challenged” minds. The young filmmakers insist that viewers forget their usual definitions of beauty, and accept these images on their own terms. Yet, these filmmakers do not treat their strange heroes with a condescending or negative attitude. While viewers may be subjected to visual and acoustic abuse, ultimately they are expected to empathize with this disturbed state of mind of the characters. By film’s end the spectators understand that the surrounding reality is abnormal, not the characters themselves. They are lost in an alien environment. Nervous, rapid camera work with its fast sequence of jump cuts, distorted angles and matching mise-en-scène further enhances the state of disorientation or transition in which these young directors find themselves today. The storyline of their short films consists of a quick succession of random episodes strung together as if the spectator had to connect the dots and come up with a final picture. In addition to young Kazakh cinema shown in the fall 2008 at the Eurasia Film Festival in Astana, new diploma works directed by graduating students have appeared. Of particular interest here are the two films: Serik Abyshev’s Butter (Maslo/Mai)and Nurken Amirovs’s Silhouettes of Almaty. I love gangster films, westerns, and historical films. Above all, I highly value the works of Bresson, Kubrick, Kurosawa (especially The Seven Samurai), so here too in my film I show the male friendship of three young Kazakh men. 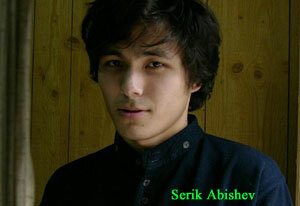 One of them (Noiman) is from the countryside and only he therefore speaks Kazakh in the film. The other two (Biba and Albai) are “asphalt children” raised in the city and severed from their roots (personal correspondence with Amirov). Cruising around town in an old but cheerfully bright red car, getting high on drugs, “confiscating” (in Michael Moore style) wealth from rich pedestrians who shouldn’t be on the streets at night, these three buddies slowly open themselves up to the viewers, talking in street jargon about everything yet nothing. We learn what is most important about these disjointed heroes: the boxer has been cheated out of his try for a championship, and another needs money for his ailing mother. They all agree to get the money by whatever means it takes. The down-on-his-luck boxer has an older “brother” who, unlike the three jovial musketeers, is a real criminal type, who draws the three buddies into his drugs business. They unknowingly follow him down a tragic road. I associate my heroes with their nomadic ancestors. The car is their battle steed. Earlier Kazakh warriors highly valued the horse. It wasn’t simply an animal but something more. 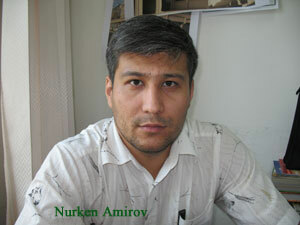 In the Kazakh epics, the warrior and his horse were one. I wanted to show these heroes as if on their horse. You remember the scene when a mysterious warrior on horseback crosses the road in front of them, as if to warn them about the danger ahead on the course which they are presently taking. But the scene didn’t have the effect I wanted (personal correspondence). The credits of Serik Abishev’s Butter tell us that this 23-minute film was sponsored by a private company at Kazakhfilm, by the Zhurgenov National Academy of the Arts (KAZNAI), and by the Creative Union “Debut”. Abishev’s film, a diploma work for the five-year Director’s course of Damir Manabai, is accredited to the “Brothers Shorty,” a humorous nickname for this artistic union, and reflects the approach to the hero, a down-on-his-luck underdog like Charlie Chaplin, whom no one seems to take seriously or wants to help. Butter opens with the signature of other young Kazakh films: the action unfolds from an opening, quasi-direct dialog. The main figure is either talking to himself or directly to the viewers. His initial words address his desperate situation. Here too (as in Nurken Amirov’s film) the major motif is money or lack thereof in the economic inequality of the new market economy that often reduces the lives of the younger generation to absurdity. The opening titles on black are accompanied with fragmented bits of speech that carry over into the opening frames, where the film’s “hero” continuous a monolog directed at some unseen, unheard, uncaring conversation partner. In this case, it is a factory boss who remains silent and indifferent. The latter responds only twice, with hostility and physical violence. Two boxes of butter— his payment for work—are thrust forward, and suddenly a black eye appears on the main character’s face. Gesticulating at someone with great emotion, he tries to persuade his unseen interlocutor that he, too, has dignity and should be paid not in kind, but in money. Who would need large boxes of butter? What should one do with them in the boiling hot Kazakh summer sun out in the steppe? An absurd and grotesquely funny situation arises, and—breaking all conventions—the main character directs his words at us: he stares right into the camera and carries on with his agitated monolog. His long opening speech is followed by some twenty minutes of quick jump shots between fragmented haphazard or random episodes: the main character tries to make sense of and survive his insane predicament by driving the two boxes of butter out into the steppe to some distant village that he can’t find. The reason for his trip there remains unexplained. Abishev’s sound track, his rapid sequence of shorts and fragmented narrative structure recall Jim Jarmusch early films, such as Permanent Vacation (1980) where the main character asserts, “What’s a story anyway? Just connect the dots and then in the end a picture of something forms.” Abishev himself asserts that he had seen Jarmusch’s Night on Earth (1991) (personal correspondence). The opening scene of Butter is grotesque and degrading: the main character begs for dignity. His salary is “a matter of principle” and the unseen observer has “no conscience.” A fish-eye camera lens distorts the warehouse setting and causes the character’s face to bulge forward unnaturally. A distorted close-up breaks down all barriers between hero and viewers. The hero, with his comically distorted face, dressed in a beisbol’ka and loud, bright short-sleeve summer shirt, makes an abrupt transition to his old beat-up car as the camera continues to shoot him from varying acute angles, tracking him first in and then outside the car. Once on the road to some steppe village, the situation goes from bad to worse. The blistering sun in a wide cloudless blue sky only melts his “salary” (the butter). Now in the countryside he stops to talk to one person after another, but all stare at him in silence. They cannot, or choose not to, understand him. Instead one large family, contradicting the usual adage about Kazakh village hospitality, simply begins to help themselves to the butter even lathering it onto chunks of bread or their arms as if a soothing oil. The main character in Butter looks abnormal, yet the viewer understands by the end that the world around him is clearly absurd and grotesque, a mirror image of post-Soviet Kazakhstan. He himself may actually be normal and he is desperately searching for something ideal or beautiful in life. As if to find some means of escape from reality, from time to time he abruptly stops the car to take from the glove compartment a classic photo of Audrey Hepburn in a black gown, with a long-gloved and elegantly raised hand with cigarette holder. This photo, with the accompanying change in the sound track, signals a momentary escape to another, more desirable world. 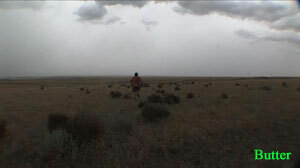 In the end he can only look to the open, empty steppe as freedom from an alienated reality. Yet even here there is no liberation from his absurd situation. Our “hero” abandons his car, the butter, and, flailing his arms, runs off into the steppe as overhead storm clouds gather. Just as at the end of Truffaut’s 400 Blows (Les quatre cents coups, 1959), we can tell from the look on the hero’s face that there is no further place to run to. The storm clouds only promise more trouble. These two films continue the tradition of the road movie as an internal psychological journey, a journey that older Kazakh filmmakers such as Darezhan Omirbaev (The Road [Jol], 2001) and Sabit Kurmanbekov (The Highway [Trassa], short, 2002) also took. In conclusion, it is the support (psychological and financial) from older experienced filmmakers along with private national funding that allows young Kazakh directors to create art house films in an environment of comparative freedom, such as that fostered at the Academy of Arts in Almaty. Yet only further support from western funding agencies and artistic freedom (without the pressure of the box office) will allow Kazakh cinema to advance as an art form. Still at best, the most successful directors will find themselves in an ambiguous and tenable position vis-à-vis the new, progressive market. Grants from IREX (International Research Exchange) and NCEEER (National Council for Eurasian and East European Research) supported the research and private screenings of these films in Kazakhstan and Kyrgyzstan.